Do you see your future together? It is never too late to plan. (Part 2) ~ Live. Share. Inspire. What will happen to our relationship? Will his love for me stay and endure even if I am away? How about our plans? Can we still turn them to reality when we are miles away? Will he wait for me? Uncertainty enveloped me for weeks while I process the thoughts. I had sleepless nights - staring at the ceiling, hoping I have a way to know the answers and wishing everything will turn out okay. Bryan has been so positive with my plans to step up. He has been so supportive for whatever actions I take that will make me improve for the better. August 2014 - I decided to go. I needed to leave the company to pursue my dreams. This meant I will be living on my own in an unfamiliar place, full of strangers. I will leave not only my workplace (that I have learned to love) but also the friendship and camaraderie that I have nurtured for more than 3 years. As days unfolded, I was filled with anxiety not knowing what the future holds. I knew Bryan will also be sad and lonely but he was so excited for me to take on my new job. He is ever supportive. He is not insecure. He has a very positive outlook, very uplifting and infectious. September 2014 - I relocated to Makati and started to work in an American company. My dream of working in an environment like that in the movie: 'The Internship' came true. The office's pantry was one of my favorite spots. We have unlimited bread (Gardenia) and spreads (special mention, Nutella)! Free cold/hot drinks from vendo and discounted goodies/chips in the 'Grab Scan n Go'. The entire place is a breath of fresh air and the environment is indeed friendly. I had few worries in the workplace. I love being in the office as it temporarily let me forget that I am alone in a big city. When I arrive in my boarding house, Bryan's soothing voice makes me feel home. Our communication has been constant and consistent. - When I am working at night, he serves as my alarm clock. He wakes me up so I can start to prepare for work. When I arrive from office, he calls me during lunch time. We talk a lot. Any thing under the sun. I wonder how he keeps things interesting. Of course, we miss each other's company every day. For 3 years, we see to it that we do our best to be flexible in order to squeeze in quality time of togetherness in our schedules. Our longest time of not seeing each other is approximately 3 months. Bryan is someone who sets up a plan in his mind on what he wants to achieve and works hard to meet those plans. You see, I am so proud of him. 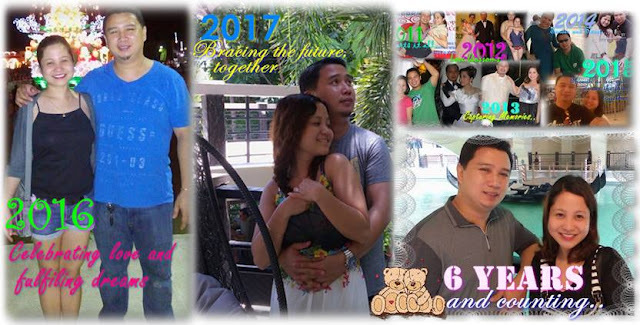 Let me share here our milestones in the relationship hoping that we can inspire others too. February 2016 - Bryan's marriage proposal. We were celebrating my birthday. April 2017 - Completed payment of the house and lot equity. September 2017 - House and Lot takeout. I will be posting updates about our haven in the next posts. We are filled with so much joy and excitement as we plan for our wedding, purchase of furniture, etc. We are working hard to turn our plans to concrete output. Still, things are still uncertain because we are still apart but we continue to have faith that God will be our guide. The next chapters of our lives are still forming. I love to impart our story to inspire others to plan for the future. If you can plan for it, then why not? I understand that not all our plans in life may be realized but at least you have your guide in embracing the future together. If possible, do not act in haste when it comes to love. True love can wait. It is never too late to plan. If you think you have skipped some stages in a relationship and you are in a position that you have to deal with it, then for sure you can make things work out fine! Give the present situation your best shot. However, you still have a lot of things to plan for. The future is still so bright and full of colors. - Yeah, you can live for today and let tomorrow take care of itself but you can still do something today to make tomorrow an easier, more fulfilled experience. We can do this! Love will help us make it through. I'll talk to you in my next blog (One of the most unforgettable experiences in the first 6 months of my stay in Makati)! Here's the story.